One of del.icio.us' strengths is how usable it is: although it might take a bit of experience to get the hang of tagging (particularly of thinking one word at a time), it is incredibly easy to create an account and to get creating and posting your bookmarks. Furthermore, del.icio.us provides usable documentation to help with the start-up process. Therefore, this section will offer a quick gloss to point you in the right direction. You'll find the "register" link in the top right corner of the del.icio.us homepage. The registration process is quick and painless (to the point of eschewing the annoying "go check your email to complete registration"). Step two of the process will help you install two essential browser buttons/links. In Safari, it is a matter of dragging two text links to your bookmarks toolbar, and in Firefox dragging two buttons. In Internet Explorer, del.icio.us will accomodate you with an installer. Once you have installed your buttons, you'll want to start tagging. Navigate to a page you want to bookmark and press the "post to del.icio.us" button. You'll get the form pictured on the right. If you are the first person to tag a page, then you will have to provide a title for the page. You can also write some brief (and brief is one of my chief frustrations) notes, and tag the page with a series of one-word terms separated by single-spaces (no commas, for those accustomed to Blogger's tagging method). No doubt: tagging is a kind of art. When I started, I found myself using a number of hypenated terms that made sense only to myself (such as "writing-technology" for anything related to Walter Ong's conception of writing as a technology that restructures thought). While there's nothing wrong with this approach, those who want to participate in the del.icio.us community will want to familiarize themselves with the recommended and popular tags. 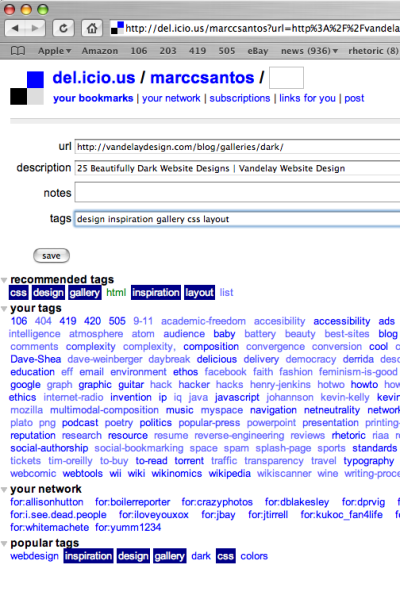 You'll find these surrounding your list of tags, as in the the image to the right. There are a number of options for customizing your del.icio.us homepage- one I find particularly helpful is "bundling" tags. If you look at the right sidebar of my del.icio.us homepage, you'll notice that not all of my tags simply appear alphabetically- some are grouped together. Look under settings (located where the "register" field was) and tags for the "bundle tags" option. This should cover the basics of setting up your account, bookmarking pages, and managing your links. The next section of the article will present three pedagogical possibilities for using del.icio.us. Up next: Pedagogical Possibility #1.